Here at JB Plumbing and Rooter, we understand that floor drains are essential for removing and preventing standing water in areas, which are prone to flooding. Floor drains are most often found in basements, garages, laundry rooms, patios, and sometimes in older bathrooms. Homeowners should test floor drains at least twice a year to ensure they are working properly. To do this, carefully pour several gallons of water into the floor drain. A properly functioning floor drain should be able to carry the water away quickly. If water takes a long time to go down the drain and pools on the floor, then there is most likely a partial clog in the pipe. 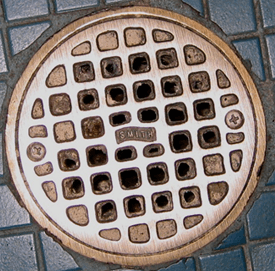 In order for a floor drain to do its job, it must remain unclogged and clear of all debris. Over time, floor drain cleaning will be required to prevent flooding and water damage. JB Plumbing and Rooter will unclog your floor drains the same way we clean a sewer or sink drain. We’ll use an electric rooter drain-cleaning machine that cuts through any and all blockages inside the pipe. Your drains will flow like new and give you trouble-free service for a long time.